Pinhole photography is photography taken to it's most simple form. Just a small hole and some photosensitive material. There are a few people in the UK who have really mastered using this technique (see Paul Mitchell's work in one of our featured photographer issues). 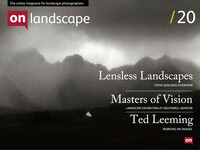 Steve Gosling has mastered this process over the years and has produced a wonderful book of 'Lensless Landscapes' which we have featured in a review elsewhere this issue. We caught up with Steve at his home in Harrogate and asked him a few questions about his work. Here are the pictures featured in our interview.